Pink Heart String: Lazada Voucher Code for My Valued Readers in PH! Lazada Voucher Code for My Valued Readers in PH! I don't know about you but me, I go to Lazada whenever I need to buy some stuffs. You have a variety of choices from kid's movies to home needs. (I won't make this post long.) If you want to know more about Lazada, you can refer to my previous post about or just jump into their website and check out the items they have. Don't worry, this isn't a scam. I have ordered items from them so many times already. I even bought an iPod from them. And yes, diapers too!lol. For my readers in the Philippines, here is a treat for you. 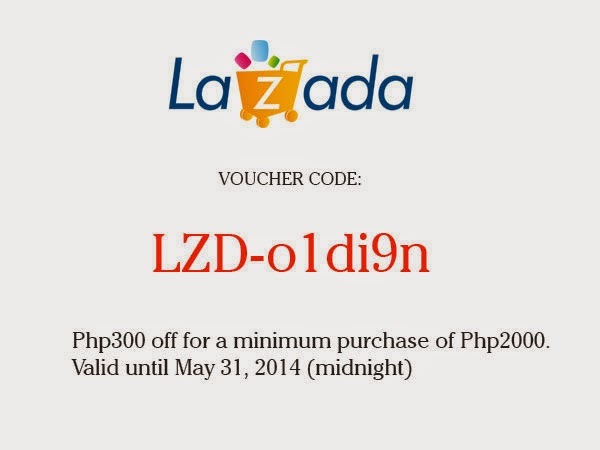 A Lazada voucher code worth Php300 off for a minimum purchase of Php2000. Simply enter the code before checkout! Take note, this is only valid until May 31, 2014 (midnight). So go grab the stuffs you want! Visit Lazada now! Disclaimer: I am an affiliate of Lazada. I will receive compensation if you purchase through my link but that doesn't affect the price of the items you'll purchase. cool to share the discount code with your readers so that they can have a discount too.. :) Happy shopping all.